Found in the border regions of the west, north and eastern parts of the Northern Province and eastern parts of Mpumalanga, including the warmer Kruger National Park, as well as in almost the whole of Swaziland, the whole of eastern KwaZulu-Natal,and in the eastern and coastal areas of the Eastern Cape. 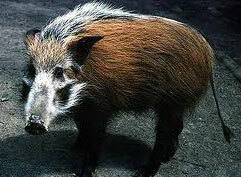 This pig isn't a mere target for hunters‚ not by any change! It is a animal that is seldom seen at daytime, always wary and hidden in the thickest of bushes, thus avoiding most danger. And when danger looms, it will try avoiding it by moving away if possible. But boy oh boy, if the heat is on, this seemingly harmless animal turns into one of the real beasts of the bush! It kills a pursuing dog in no time and may do the same to its owner. Its lower tusks holds the same serious danger to anybody than does a dagger of 20 cm (9 inches) and when a bushpig decides to become the hunter, even the leopard will hesitate and backs down in search of a easier prey (or moment) to have it his own way. I should be said, however, that leopards will easily kill a bushpig if it surprises the pig. They usually eats plant material, but don't say no to eggs, reptiles and insects that is available. They flock together in families of up to 20, with a dominant male as leader. Females yield about three to six little pigs each year. Farmers don't like them at all, because of their sloppy disruptive ways with any field of crop. They don't look like it, but can move quickly and is good swimmers as well!